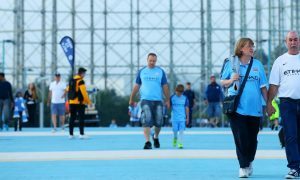 Manchester City celebrated an epic season that resulted in two trophies, most notably the Premier League, by painting Manchester blue today with a parade that stretched through parts of the city centre. Thousands of Blues lined the streets and watched as the players and staff drove past on a bus, holding up the trophy and celebrating with fans. The journey ended at Deansgate where a special event took place on a stage, with players delighting fans and vice versa. Phase Two of the Champions range has been released! Celebrate City’s Premier League win by picking up some official merchandise from the Champions range!